The anchor is up at 7:40 AM on Monday in Sainte Anne, Martinique. 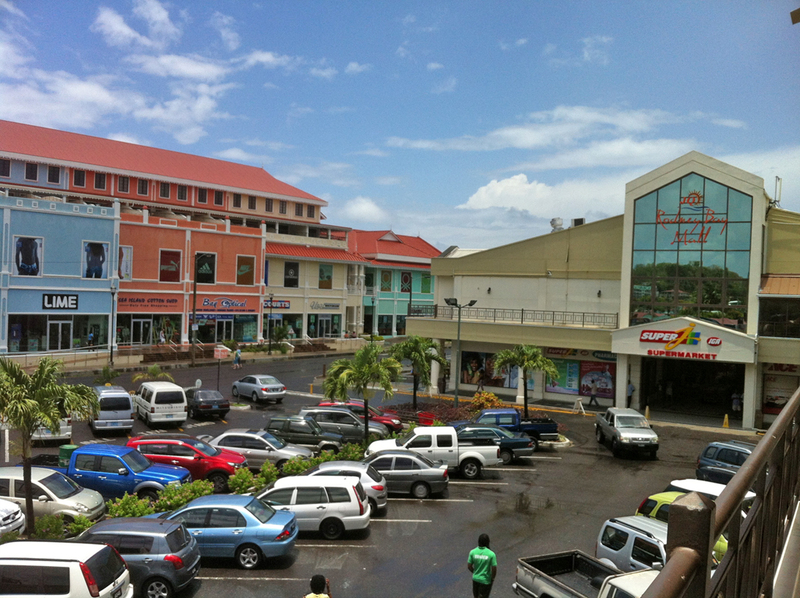 Our destination today is Rodney Bay on the island of St. Lucia, some 23 miles to the south. As has been our experience here in the Windward Islands, the trade winds are in our favor again today. 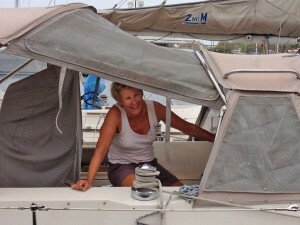 A broad reach in 20 knots of wind places Cutter Loose in her slip at Rodney Bay Marina precisely at noon. 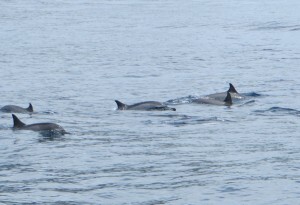 We are escorted into the harbor by a junior tag team of dolphin. This is our first marina experience since February 1st at Nanny Cay when we stopped to bid farewell to Caribbean 1500 friends Ken and Laurie of Adagio. Cutter Loose is equipped to cruise for months on end without visiting a marina. 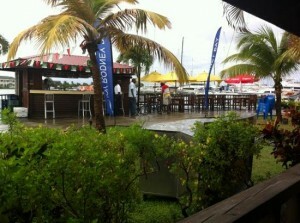 However, she is pampered with maintenance during her stay at Rodney Bay Marina. After a thorough wash, her topsides are compounded and waxed and the stainless steel deck hardware is meticulously polished. It is nearly impossible to stay ahead of the cumulative effect of saltwater on deck hardware. The powerful rays of the sun here have faded her canvas and gelcoat. 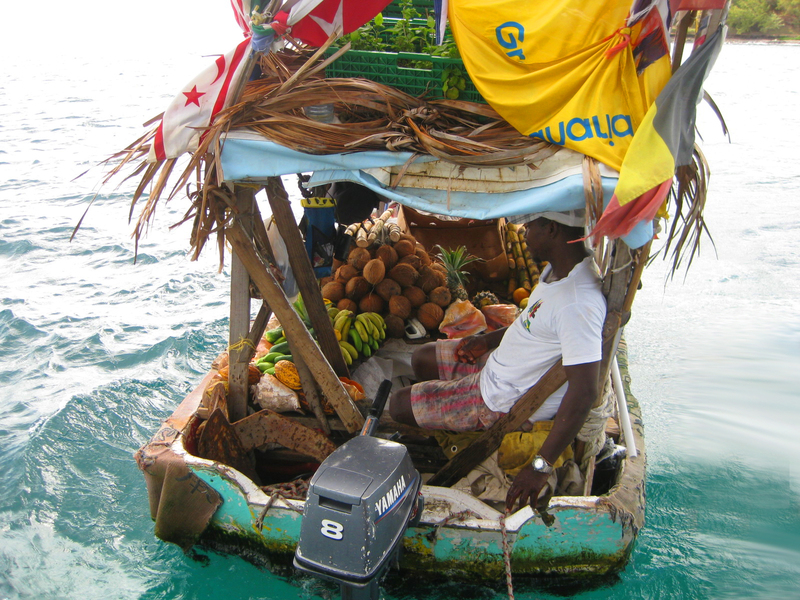 The Caribbean exacts its toll on boats that cruise these waters. On the other hand, we are spending more time sailing and less time motoring, resulting in a 33% reduction in engine hours for our Caribbean cruise compared to last year’s trip to Florida and the Bahamas. Time passes rapidly here at Rodney Bay. Boat chores and provisioning are accomplished by day while socializing begins just before sundown. There is a community of sailors from the U.S, Canada and the UK that make Rodney Bay their home away from home. With reasonable dockage rates, floating docks, excellent security and an abundance of available amenities and services within walking distance, it is little wonder that this marina is a popular stop along the way. 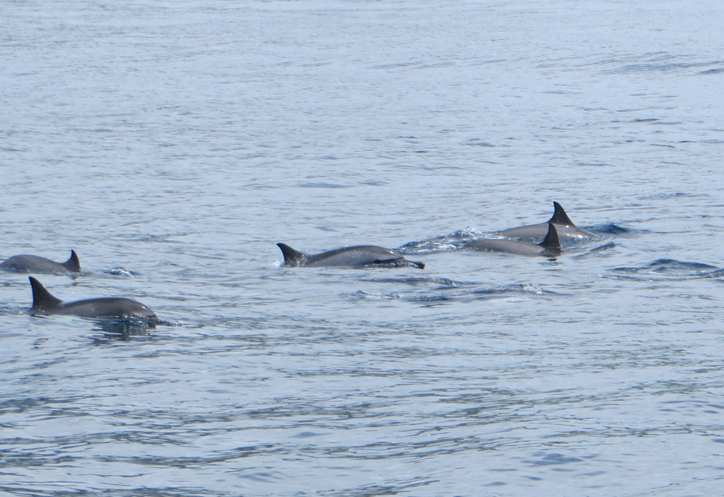 Within hours after our arrival, we are invited to an impromptu dock party to meet some of our new neighbors. 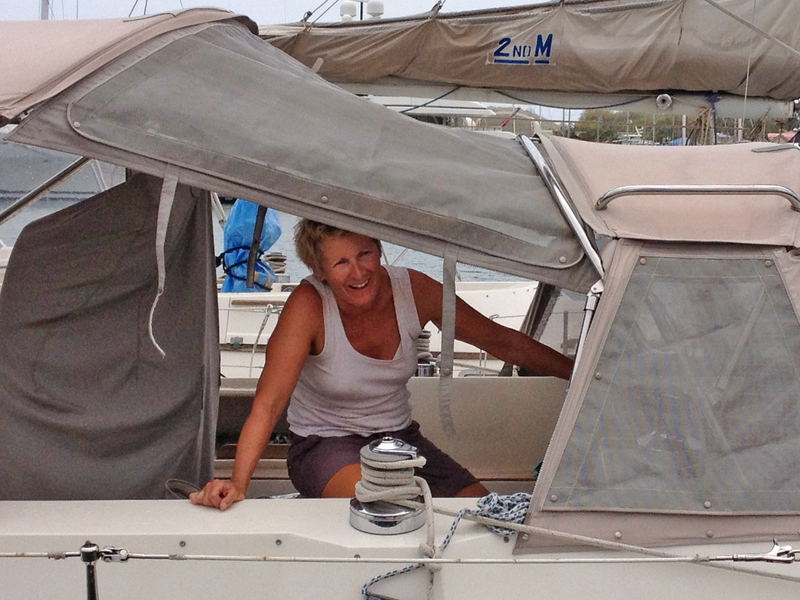 As luck would have it, Helen and Peter from the UK aboard Common Crossing are docked next to Cutter Loose. We have crossed paths with them continuously since St. Martin, but never had the opportunity to become acquainted. We enjoyed our time socializing with them and hope to see them again next season. 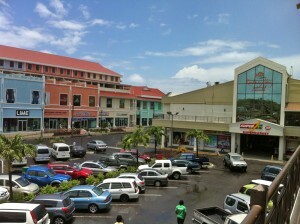 In contrast to Martinique, Rodney Bay offers some of the best grocery stores that we have experienced since St. Martin. The downtown area features two shopping malls, three modern grocery stores, a casino and dozens of restaurants. From the marina, a five minute jaunt in the dinghy takes us to an intown dock located within steps of all the action. There has been a distinct change in the weather here in paradise. Several times each day, squalls bring high winds and heavy rain interspersed with periods of sun and clouds. This is a departure from the five minute variety rain showers we have experienced thus far in the Caribbean. Apparently, a stubborn upper level TROF in the southern Caribbean basin is not expected to disappear anytime soon. Marine forecaster Chris Parker warns that there is the possibility of squalls every day for the foreseeable future. Locals tell us that this weather pattern is more characteristic of June or July. In Dominica, recent flooding and landslides have resulted in the loss of life. Hiking to Victoria Falls and Sari Sari Falls would be inconceivable under current weather conditions. Pittsburgh friends Tricia and Mark arrive at a nearby resort on Wednesday afternoon. Prior to their arrival, we receive a special request from Tricia via e mail. She and Mark wish to renew their marriage vows aboard Cutter Loose. She wants to know if we can accommodate. Special orders don’t upset us, especially in places such as Rodney Bay where English is spoken and supplies are readily available. With ceremony script in hand and flowers and champagne chilled in the fridge, Cutter Loose is underway from her slip in the lagoon en route to Rodney Bay where we anchor in the company of several cruising boats near Pigeon Island. Bride and groom are dressed in wedding attire. 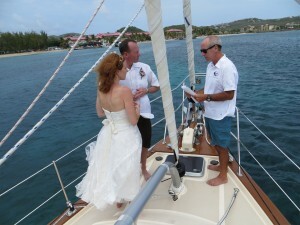 The foredeck ceremony proceeds without a hitch. After the couple seals the arrangement with a kiss and an embrace, the anchorage erupts in cheers. Later that evening, Mark and Tricia treat us to dinner at the Edge Restaurant. During their stay, we enjoy meals, conversation and time spent together. We wish them a lifetime of marital bliss. 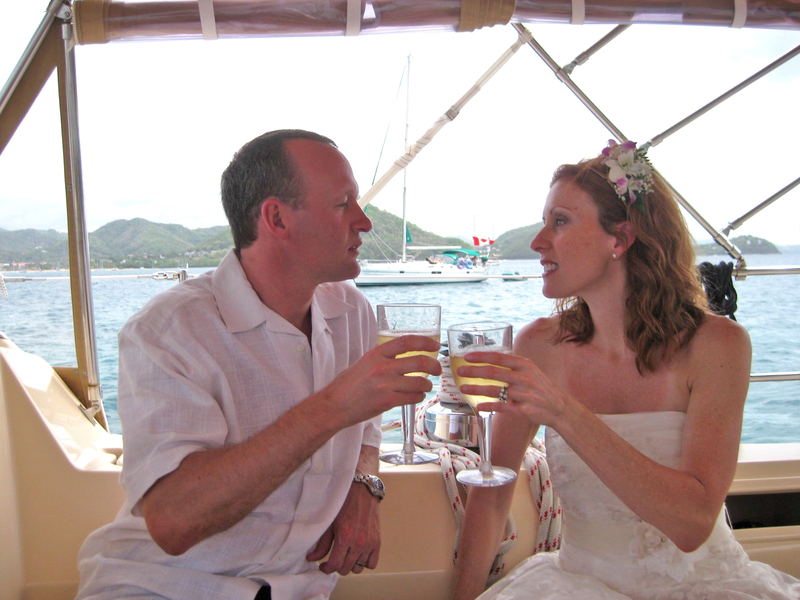 The tempo of our winter cruise changes dramatically after our stay at Rodney Bay. Gone are the days when we relax for weeks on end at anchor in an enjoyable spot. We now have a date with the silver bird. There is a considerable amount of work involved in preparing the boat for hurricane season prior to our departure on May 8th. 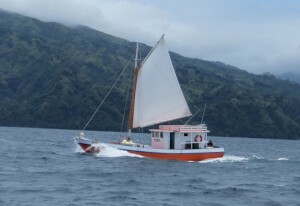 Cutter Loose is on a fast track to Grenada. Under these circumstances, our remaining stay in St. Lucia will be brief. After clearing customs and topping off the fuel tank with duty free diesel, Cutter Loose is underway from Rodney Bay Marina on Saturday morning, bound for the town of Vieux Fort at the southernmost extremity of St. Lucia. The sky is overcast with intermittent rain showers. The busy port of Marigot appears to be quite interesting from the cruising notes. Several cruising boats are entering and leaving this harbor as we pass by. We make a mental note to call here on a subsequent cruise. 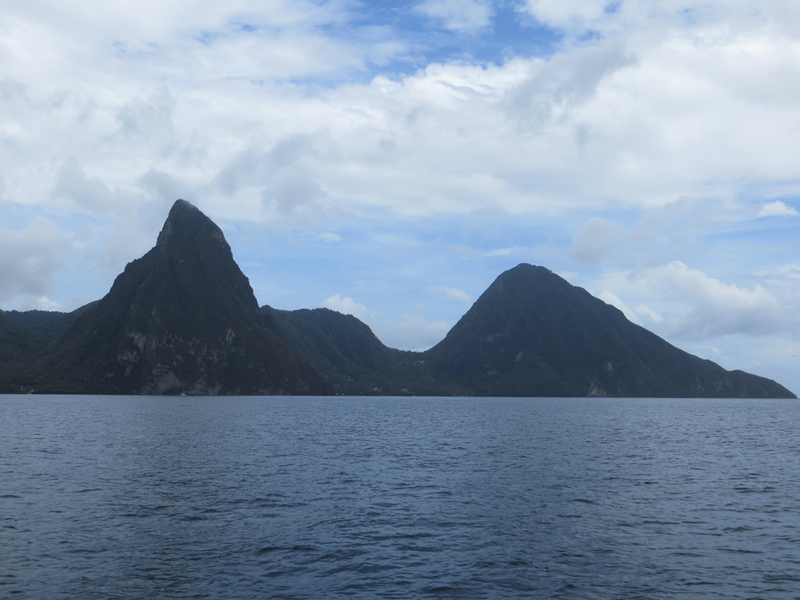 Twenty miles south of Rodney Bay, there is partial clearing in the sky as we pass the Pitons…two huge volcanic projectiles dramatically rising from the water. A mile offshore, a boat boy comes alongside Cutter Loose in his skiff, welcoming us to paradise as he offers a mooring for the night. It would be delightful to wake up tomorrow morning in the shadow of the majestic Pitons, but we feel compelled to move further south today in order to make for a shorter sail to St. Vincent and the Grenadines on Monday. We are a bit apprehensive about anchoring in Vieux Fort for the night. There was an alleged incident involving forced entry into a pleasure boat in this harbor while the owner was dining ashore. Since we have already cleared out of St. Lucia, we will not be going ashore in Vieux Fort. Besides, the harbor is well protected from the easterlies and today’s weather is deteriorating rapidly. We are pounded by yet another squall three miles shy of our destination. In the interest of safety in numbers, our strategy will be to anchor in proximity to other cruising boats. Upon arrival, however, there are no other pleasure boats in the harbor. There is a definite industrial feel to this place. A small container ship is being unloaded at the deep water port. Cutter Loose is the sole representative of the cruising fleet in this harbor tonight. The area of the Windward Islands south of Rodney Bay in St. Lucia to Bequia in the Grenadines requires vigilance. Documented cases of theft and personal injury aimed at pleasure boaters are rare. In the immortal words of Ben Franklin, an ounce of prevention is worth a pound of cure. Since St. Martin, our standard practice has been to chain the dinghy to the boat and lock all ports, hatches and companionway hatch boards before retiring for the evening. Besides, the weather tonight is dreadful. Presumably, petty thieves do not operate in pelting rain and wind. By sunrise tomorrow morning, Cutter Loose will be underway to St. Vincent and the Grenadines.